The oil and gas boom has been underway for a number of years in many locations across North America, and many stories have come to light about individuals and families whose lives have been personally affected. This post is part of a regular weekly series of those stories on this blog to help you envision what could happen if drilling expands along the Beartooth Front, and what is possible to keep that from happening. I think you’ll enjoy today’s story. It’s a unique example of how the talent and wit of a single man have been enough to keep the powerful oil and gas industry at bay. He is also driving the oil and gas industry crazy. 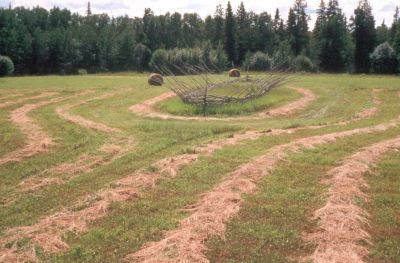 Tiesenhausen owns the surface rights to his 80-acre split estate in western Alberta near the British Columbia border. He inherited the land from his parents, who were farmers. The land sits on top of a natural gas hot spot known as the “deep basin.” The oil and gas industry has been lusting after the property since a Calgarian discovered rich geological formations there in the early 1970s. According to Canadian law his surface ownership goes six inches deep. The provincial government owns the riches below. As in the United States, the government retains rights to sell the mineral resources and force von Tiesenhausen to allow companies onto his property to extract them, so long as he is compensated for the disturbance. He understands from personal experience how the realities of harvesting natural resources can conflict with private land ownership. He spent 14 years as a heavy equipment operator, working in oilfields and in construction all over the world. The Watchers/Journey, an exhibition by Peter von Tiesenahausen. 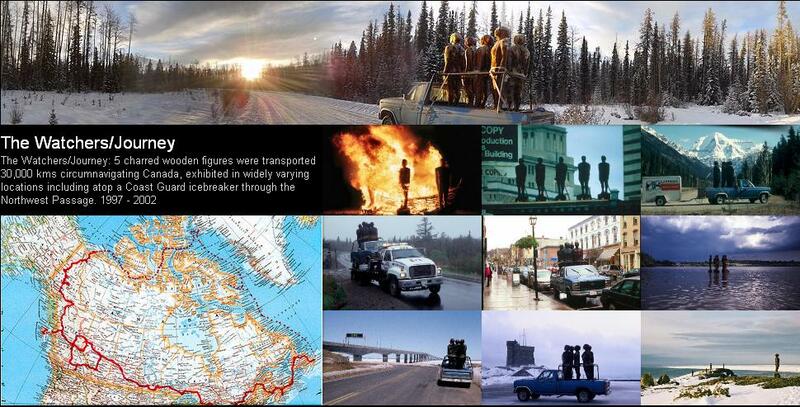 From 1997-2002, five charred wooden figures were transported 30,000 kilometers circumnavigating Canada, exhibited in widely varying locations, including atop a Coast Guard icebreaker through the Northwest Passage. Click to enlarge. While he has spent the last 25 years earning his living as an artist, the oil and gas companies have not touched his land. He’s kept them away by using a fundamental legal tool: copyright law. To fortify his changed livelihood on his family legacy, he has copyrighted his spread as a work of art. The action mimics strong legal foundations of pharmaceutical, computer software and publishing corporations, he pointed out. 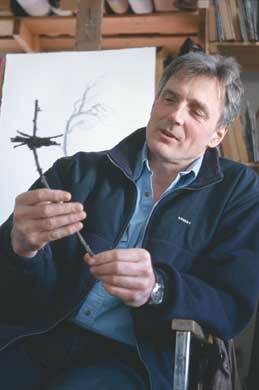 Around his home and studio, his property is studded with artwork such as a 33-metre-long ship sculpted with willow stalks, winter ice forms, nest-like structures in trees, statuesque towers and a “lifeline” or visual autobiography composed as a white picket fence built in annual sections left to weather naturally. His legal move vastly increased the amount of compensation he is potentially entitled to demand from any oil or pipeline company wanting access to his place, because changing his property would be copyright infringement. In 2003, he presented his copyright argument before the Alberta Energy and Utilities Board, which told him that copyright law was beyond its jurisdiction and he would need to pursue that in the courts. So far that hasn’t been necessary. The oil and gas companies have since backed off, even paying for an expensive rerouting of pipelines, and have yet to bother testing his copyright. Thiesenhausen says he used to get visits from oil company executives trying to intimidate him, but they’ve pretty much stopped. Despite having unlimited resources, it’s unlikely any oil and gas companies will want to put the copyright exclusion to the test. They could wind up creating case law that will encourage others to follow Tiesenhausen’s path. I usually try to find a way to tie these personal stories to lessons we can learn along the Beartooth Front. This one is so unique that finding a lesson is difficult. I think maybe the point is one you learned from your father when you were a child: you have to punch bullies in the nose. When you do, they back down. This entry was posted in Personal stories and tagged Alberta, copyright, personal stories, Peter von Tiesenhausen. Bookmark the permalink. to go anywhere near his land. They can drill a mile away and whipstock under his land anywhere they want and he will get squat. He doesn’t want them tearing up his land to put pipelines through. He is not interested in making money. We have less than 40 acres that already has a 200 ft right of way for an APE line, a 50 ft easement for a local gas company, and now they are putting a huge gas line that will be an additional 100 ft wide swath through our woods. I am just sick over it all.